being loaded in other supplier's yards. Materials are delivered 3 - 5 days of ordering." order was delivered on time every time. I would highly recommend this company to anyone!!" Spencer Construction we put Bar T Building Stuctures second to none. Thanks so much guys!!" 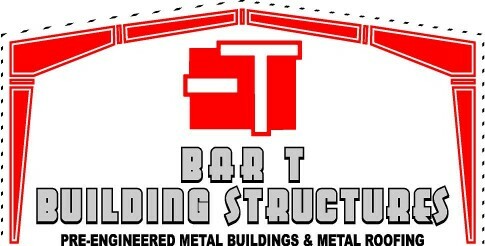 "Bar T Building Structures is very knowledgeable in the steel industry. They are very easy to talk to. They have good pricing!! I would recommend them for any of your projects." "As a local contractor you look for hometown businesses with Integrity, and that will treat you right. Bar T stands behind their word and delivers on quality and experience. I recommend these guys for all your metal needs!" "Great service!!!! And great prices! You could ask for a better place to supply your building and metal needs." "When it comes to structural metal, roofing panels with trim or welding supplies Bar T has excellent customer satisfaction in every project. Marcus is the only one I use and recommend to my customers. Thanks Bar T﻿!" "Bar-T Building Structures, Marcus Bartee, Shane Pierce and Terry Ingram constructed one heck of a building for my husband and I. They kept us informed on daily operations if there might be a delay on supplies or weather, we knew what to expect. Haven’t had that in a long time. Sure was nice. Each guy made this building like it was their own. We all know the quality of work you get when the guys take pride in their work. We were truly blessed to find these guys. We would highly recommend this company along with these guys. God bless you all﻿!!"